Congress may well have trouble passing ambitious legislation these days, but they remain masters at summoning indignation. As a piece of political theater, the House Energy and Commerce Committee hearing on Tuesday into Toyota's troubles had everything you could hope for: testy exchanges, Clintonian hairsplitting, obnoxious grandstanding, tearful testimony and even multiple references to Marisa Tomei's automotive wizardry in My Cousin Vinny. But the spectacle failed to untangle the knottiest question looming over the proceedings: whether Toyota has definitively pinpointed the problem causing its cars to accelerate out of control. By hauling the top brass of the world's largest automaker to Capitol Hill for a public flogging, House members got to vent their outrage at Toyota's sclerotic response to the crisis. So far the once revered company has had to recall more than 8 million vehicles for issues ranging from troublesome floor mats to sticky gas pedals to faulty brakes. But several committee members maintained that Toyota has failed to address the possibility that scrambled computers in its cars could be the culprit. In a blistering letter submitted to Toyota's U.S. president, James Lentz, before the hearing, Representatives Henry Waxman and Bart Stupak wrote, "Our preliminary assessment is that Toyota resisted the possibility that electronic defects could cause safety concerns, relied on a flawed engineering report, and made misleading public statements concerning the adequacy of recent recalls." During his testimony, Lentz acknowledged that "it has taken us too long to come to grips with a rare but serious set of safety issues, despite all of our good-faith efforts." But he insisted that Toyota has resolved the manufacturing defects responsible for some 2,600 instances of sudden unintended acceleration and 34 deaths since 2000. "We are confident that no problems exist with the electronic throttle-control system in our vehicles," Lentz said in his statement, citing extensive testing of the system's fail-safe mechanisms. But under questioning from Waxman, Lentz conceded he was "not totally" certain that Toyota had fixed the problem. To safeguard against further occurrences, the company said it would install brake-override systems in its new North American vehicles by the end of year, and retrofit older models where possible. 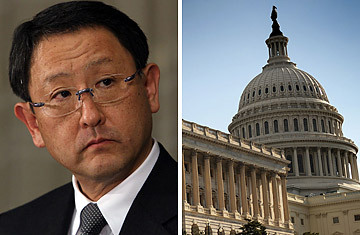 When he takes his turn on the hot seat on Wednesday, Akio Toyoda, the company's president and CEO  and grandson of its founder  will attempt to mollify his detractors with a heavy dose of contrition. "Toyota has, for the past few years, been expanding its business rapidly," Toyoda said in a prepared statement that he is expected to read at Wednesday's hearing. "Quite frankly, I fear the pace at which we have grown may have been too quick." He also said the company would give greater weight to customer complaints, mandate that managers drive the company's cars and improve communication between the company's international branches. Toyoda won't be the only one in the crosshairs on Wednesday. Transportation Secretary Ray LaHood will speak on behalf of the National Highway Traffic Safety Administration (NHTSA), the regulatory body whose apparent lax oversight  since 2003 it opened and closed eight investigations of Toyota vehicles due to customer complaints  was pilloried on Tuesday. Accounts of NHTSA's failure to piece together a pattern of customer complaints have made the group one of the saga's twin villains. "Shame on you Toyota, for being so greedy, and shame on you, NHTSA, for not doing your job," said Rhonda Smith, a former social worker from Tennessee who, during emotional testimony, recounted a 2006 incident in which her Lexus ES 350 accelerated to more than 100 m.p.h. despite repeated braking. NHTSA "failed all along the way," Joan Claybrook, who formerly led the agency and who is scheduled to speak at Wednesday's hearing, told TIME earlier this month. But it is Toyota, a company that built its reputation through its dogged commitment to reliability, that has plunged the farthest. Wednesday's appearance will mark the culmination of a brutal month for its chief, who has been battered by the media for his sluggish response to the crisis. Toyota surely hoped that the worldwide recall of its flagship Prius and other hybrid models earlier this month would close an ugly chapter in its storied history. But a series of damaging revelations has rekindled whispers that the automaker has valued profits over safety. In a document dated July 6, 2009, and obtained by the House Oversight Committee, Toyota officials claim it saved $100 million in 2007 by negotiating a limited recall of Camry and Lexus models rather than taking more drastic actions. The same document cites as a challenge the "activist [Obama] Administration," which owns a 61% stake in competitor General Motors and an interest in Chrysler. Under questioning from Democratic Representative John Dingell of Michigan, Lentz denied that the company believed politics helped spur the inquiry. Other reports, however, suggested that Toyota  which has 172,000 U.S. employees and a well-oiled Capitol Hill lobbying operation that has spent nearly $25 million over the past five years  could just as easily be the beneficiary of government favoritism as the victim. Meanwhile, Toyota has revealed it had received a federal grand-jury subpoena over its management of safety issues, as well as a Securities and Exchange Commission subpoena asking it to produce documents related to its "disclosure policy and practices." As its president acknowledged, the company is speeding toward a reckoning. "I myself, as well as Toyota, am not perfect. At times, we do find defects," he said. "But in such situations, we always stop, strive to understand the problem and make changes to improve further." It's not clear the company has done that in this case, and in failing to do so it may have driven itself to the precipice. See pictures of the most reliable family cars. See the most exciting cars of 2010.